ITEA thanks these Life Members for their devotion, dedication, and support of the Association, and their personal commitment to the professional excellence embodied in advancing the test and evaluation industry. Save Time and Money! Sign up TODAY for a Lifetime Membership in ITEA! Lifetime Membership in ITEA is available to be purchased at a rate that depends on your age. 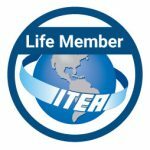 If you have any questions about ITEA Lifetime Membership, please contact James Gaidry, CAE, at jgaidry@itea.org, or call 1-703-631-6220.